DAD-IS is the Domestic Animal Diversity Information System hosted by FAO. It is a communication and information tool for implementing strategies for the management of animal genetic resources (AnGR). It provides the user with searchable databases of breed-related information and images, management tools, and a library of references, links and contacts of Regional and National Coordinators for the Management of Animal Genetic Resources. It provides countries with a secure means to control the entry, updating and accessing of their national data. The Umblachery is found in the region of Thanjanvur, Tamil Nadu in India. It is a draft breed of the zebu type, similar to Kangayam but smaller. They are grey with white points and back-lines. Calves are red or brown with white markings. The breed is rare. Reference: Mason, I.L. 1996. 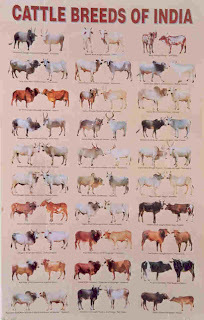 A World Dictionary of Livestock Breeds, Types and Varieties. Fourth Edition. C.A.B International. 273 pp. TharparkarAlso Known As:White Sindhi Origin The Tharparkar a Bos indicus breed used for milk production and as draft animals. Tharparkar are of the lyrehorned type of zebu cattle. The Tharparkar came into prominence during the first World War when some animals were taken to supply milk for the Near East army camps. Here their capacity for production under rigorous feeding and unfavorable environmental conditions at once became apparent. Since then many breeding herds have been assembled in India and Pakistan. When left on arid pasture the milk production is approximately 1135 kg per lactation, while those animals maintained in the villages average 1980 kg. SahiwalThe Sahiwal originated in the dry Punjab region which lies along the Indian-Pakistani border. They were once kept in large herd by professional herdsmen called "Junglies". However with the introduction of irrigation to the region they began to be kept in smaller numbers by the farmers of the region, who used them as draft and dairy animals. The Sahiwal is one of the best dairy breeds in India and Pakistan. It is tick-resistant, heat-tolerant and noted for its high resistance to parasites, both internal and external. Cows average 2270 kg of milk during a lactation while suckling a calf and much higher milk yields have been recorded. Due to their heat tolerance and high milk production they have been exported to other Asian countries as well as Africa and the Caribbean. As oxen they are generally docile and lethargic, making them more useful for slow work. Red SindhiAlso Known By:Malir (Baluchistan), Red Karachi, Sindhi The Red Sindhi originated in the Pakistani state of Sind but due to its hardiness, heat resistance and high milk yields they have spread into many parts of India and at least 33 countries in Asia, Africa, Oceania and the Americas. The average height of a Red Sindhi cow is 116 cm with a body weight of 340 kg. Bulls average 134 cm in height and a body weight of 420 kg. They are normally a deep, rich red color but this can vary from a yellowish brown to dark brown. Males are darker than females and when mature may be almost black on the extremities, such as the head, feet and tail. RathiThe Rathi is a Bos indicus breed used for draft and dairy purposes. It originated in Bikaner and Ganganagar in northwest Rajasthan, India. The breed is usually dark red or tan but occasionally spotted individuals can be found. The Rathi originated from the Sahiwal and Tharparkar breeds. They should not be confused with the Rath breed which is a separate breed kept by the nomadic Rath cattle breeders. Ponwar Origin The Ponwar is small and compact with frequent white markings on the forehead, dewlap and limbs. Black and white color is often seen in the hill type of cattle and these features are also common in the Ponwar breed. However, the horns are inclined to be lyre-shaped, which may be due to some mixture of the nearby plains cattle. The breed is restricted to a small geographical area of Pilibhit district of Uttar Pradesh, India. Characteristics The animals of this breed possess a small, narrow face, small ears and big, bright eyes. The forehead is slightly concave and often has white marking. The horns are long, upstanding and lyre-shaped. They measure from 12 to 14 inches in length. Krishna ValleyOrigin The Krishna Valley breed of cattle is used exclusively in the black cotton soil of the watershed of the River Krishna and other adjacent rivers such as Ghatprabha and Malprabha in the southern portions of Bombay State and Krishna Valley tract of Hyderabad State of India. Khillari Origin There is every reason to believe that the Khillari breed, with its several varieties, owes its origin to the Hillikar breed of cattle from Mysore State. Unlike some of the other breeds of cattle in India, it does not take its name from a geographical area. Khillar means a herd of cattle, while Khillari means belonging to Khillar; hence the herdsman is known as Khillari; in the Satpura range of hills, he is known as Thillari. There is a special tribe of professional cattle breeders in this region known as Thillaris. Kherigarh Origin The Kherigarh cattle are closely tied to the Malvi breed. The breed is mostly found in the Kheri district of Uttar Pradesh, India. Though the horn formation is typical of the lyre-horned Malvi type, the animals of the breed are much lighter in general appearance than the Malvis. Characteristics The Kherigarh cattle are generally white or gray in color. The face is small and narrow. Horns are thin and upstanding and measure 12 to 18 inches in length in bulls; cows usually have smaller horns. The ears are small and the eyes bright. The neck is short and looks powerful. The hump is well-developed in bulls. The dewlap is thin and pendulous and starts from right under the chin and continues right down to the brisket. The barrel is broad and deep. The sheath is short and moderately tight. Limbs are light. The tail is long, ending in a white switch. KankrejAlso Known by:Bannai, Nagar, Talabda, Vaghiyar, Wagad, Waged, Vadhiyar, Wadhiar, Wadhir, Wadial. The Kankrej breed of cattle gets its name from a territory of that name in North Gujarat of Bombay Province, India. The breed comes from southeast of the Desert of Cutch in western India, particularly along the banks of the rivers Banas and Saraswati which flow from east to west and drain into the desert of Cutch. In Radhanpur State, which is adjacent to the Kankrej tract, the breed is known as Wadhiar. In Cutch State it is known as Wagad or Wagadia, taking its name from the community of herdsmen who breed these cattle. Characteristics The Kankrej is on of the heaviest of the Indian breeds of cattle. HarianaThe Hariana a Bos indicus breed used for draft purposes in northern India where they are found. They are well suited to fast road work, being able to pull a one ton load at 2 miles per hour and cover 20 miles a day. While females are kept primarily for breeding of oxen, they are also milked. The breed averages 1400 kg of milk per lactation but high producing animals will produce over 2300 kg in a single lactation. The breed belongs to the shorthorned type of zebu and is grey or white. The average cow weighs 310 kg and the average bull 430 kg. Hallikar The Hallikar is a Bos indicus breed selected primarily for draft purposes and are of the Mysore type of zebu cattle. Considered one of the premier draft breeds in India they are often raised by families who have specialized in production of Hallikar draft animals for hundreds of years. It is not unusual for a cow to be brought 100 miles to mated with a bull from these breeders. They are found primarily in the southern region of Karnataka state, in the area surrounding Mysore, in the bottom of the Indian peninsula. In addition to normal draft uses the breed is also used for cart racing. Once trained, a team of Hallikar oxen can pull a loaded cart over rough roads at a rate of 40 miles per day. Gaolao Origin The Gaolao cattle fit into the group of shorthorned, white or light-gray in color, with a long coffin-shaped skull, orbital arches not prominent and with a face slightly convex in profile. It is also observed that the native home of the breed is located along the route taken by the Rig Vedic Aryans from the Northern passes through Central India to the South. There is a close similarity between the Ongole and the Gaolao except the latter are much lighter, with greater agility. Dangi Origin Dangis have taken their name from the tract of the country in Bombay State known as Dangs. It is a hilly tract with heavy rainfall and very poor agricultural economy. The breed has become well-known on account of its hardy nature and its ability to work hard under heavy rainfall conditions. The Dangi breed, which is similar to Deoni, appears to fit into the group of cattle represented by the Gir, Red Sindhi and Sahiwal. Characteristics The Dangis are of broken red and white or black and white color. The animals are medium in size, with deep bodies and generally of ponderous build. The height behind the hump ranges from about 45 to 50 inches while the heart girth measures from about 58 to 60 inches, on the average. The head is usually small with a slightly protruding forehead. The muzzle is large. The horns, though of variable size, are generally short and thick. The ears are small. OngoleOrigin The Ongole breed, like other breeds of cattle in India, takes its name from the geographical area in which it is produced. It is also called the Nellore breed for the reason that formerly Ongole Taluk, a division of a district, was included in the Nellore district, but now it is included in the Guntur district. The area is part of the Andhra Pradesh in India. This breed is included among the gray-white cattle of the north, having white or gray color, stumpy horns and a long coffin-shaped skull. It has a great similarity with the Gaolao breed of Madhya Predesh and also has a resemblance to the Bhagnari type of cattle in the north of India. This similarity is not surprising in view of the fact that these breeds lie along the path taken by the Rig Vedic Aryans in their march from the north to the south of India.